Zehnder Residential Ventilation Systems offer amazing air quality for indoor health, comfort, and energy efficiency. 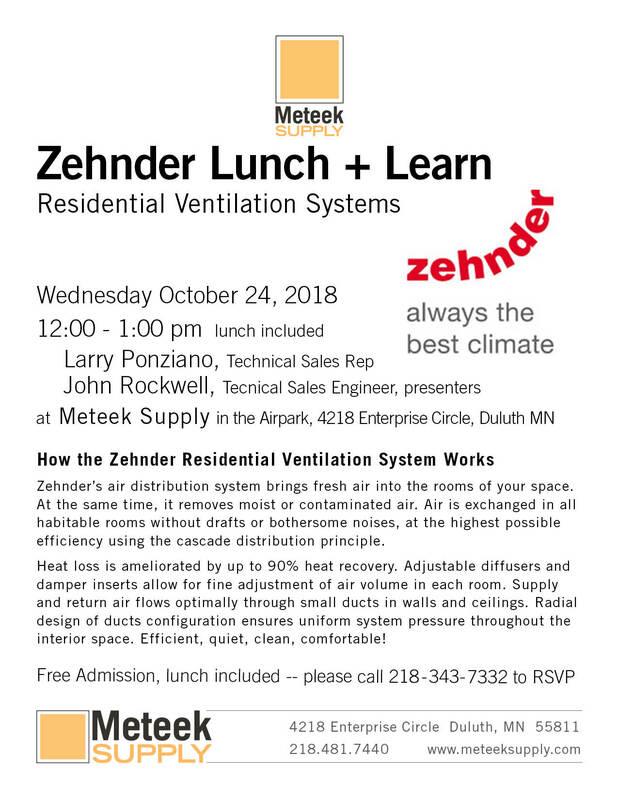 Meteek Supply is excited to host a lunch and learn Wednesday, October 24, 2018 12-1:00 pm with Zehnder Residential Ventilation Systems. Zehnder offers an amazing air quality system for indoor health, comfort and energy efficiency. Zehnder’s air distribution system brings fresh air into the rooms of your space. At the same time, it removes moist or contaminated air. Air is exchanged in all habitable rooms without drafts or bothersome noises, at the highest possible efficiency using the cascade distribution principle. Heat loss is ameliorated by up to 90% heat recovery. Adjustable diffusers and damper inserts allow for fine adjustment of air volume in each room. Supply and return air flows optimally through small ducts in walls and ceilings. Radial design of duct configuration ensures uniform system pressure throughout the interior space. Quiet, clean, comfortable! Health Fresh air promotes well-being and a healthy lifestyle. Poor indoor air quality can lead to a rise in asthma and allergic symptoms due to the increased concentration of allergens such as dust mites, VOCs, pollen, and mold. With optional fine filters to capture fine dust and pollen, even allergy sufferers can breathe easily. Energy Savings Zehnder products use recovered and renewable energy sources to heat and ventilate our increasingly airtight homes and buildings in an energy efficient and environmentally friendly manner. Furthermore, whole house heat recovery ventilation technology can recover up to 90% of the heat from exhaust air. Comfort On average, we spend approximately 70% of our time inside. A comfortable environment is important to both our health and our sense of well-being. Zehnder products offer good air quality through continuous extraction of moist, stale air from bathrooms and kitchens. Moreover, a continuous supply of clean, tempered air flows to habitable rooms. Low-velocity air supply ensures that fresh, clean air does not create drafts around the home. Join us 12-1:00 pm on Wednesday, October 24, 2018 for more exciting information about how Zehnder products can improve your indoor air quality. Please RSVP at 218.343.7332—we look forward to seeing you!